I notice that Acell website (www.acell.com) is marketing to the hair transplant industry. They have a link to a page that talks about donor area repairs and plucked hairs. It looks like the product is readily available. Same info Hitzig and Cooley presented. » available. Same info Hitzig and Cooley presented. ACell is promising, Drs. Cooley, Hitzig and Epstein deserve a lot of CREDIT AND THANKS for their research using ACell, but I think they still haven’t proved indisputably that it works to substantially improve HT or autocloning. It seems they have tried almost every type of experiment – repairing old scars with ACell, using ACell in conjunction with HT and plucking, two side-be-side tests of scalp hair and beard hair both with ACell, etc. Direct, side-by-side comparison of HT/plucking WITH ACELL on one field of scalp, versus the same WITHOUT ACELL on an adjacent field of scalp. All other conditions must be controlled. Needless to say the tests should be using the same patient: it is much more useful to compare two areas of scalp on one patient than one area on each of two different patients, because responses are highly idiosyncratic. And this is best done on scalp that has minimal or no existing terminal hair. The scalp field with NO ACELL applied would be considered the “control” part of the experiment. The one thing that worries me in all this is that, without clean, side-by-side experiments of ACell versus no ACell, with all other conditions being the same, we are not really getting an objective view of its utility, only subjective opinions by the doctors, and mental comparisons of ACell cases with non-ACell cases from the doctors’, and our own, memories. » » available. Same info Hitzig and Cooley presented. » side-be-side tests of scalp hair and beard hair both with ACell, etc. » scalp, versus the same WITHOUT ACELL on an adjacent field of scalp. » ACELL applied would be considered the “control” part of the experiment. If they sprinkled my plucked hairs with talcum powder, and stuck them in my scalp, and it grew hair–I couldn’t care less whether they did a controlled experiment to see if the talcum powder was necessary or not. » “A three year legal battle finally is behind us. This article is from 2007!!! Their business volume in regenerative medicine seems to be poor and maybe they are searching for a niche in HT where they can make money. why are you still here? not cured? you promote this “breakthrough” all the time, and now you are too f…king cowardly to be the first??? wasn`t your butchered head abused enough??? » controlled experiment to see if the talcum powder was necessary or not. Right, but these doctors are all claiming “amazing” results, or at least better results, with ACell. My concern is that it is just too easy for these docs to tout it and hype it up to “get patients in the door” for HT in a poor economy, where business has probably dropped off considerably in the past 2 years. Someone else mentioned this possibility in a post a couple of weeks back, too. HT surgeons generally don’t like to do research. The vast majority of them don’t spend a penny on true research, and run their clinics like assembly lines – production facilities where the idea is “get 'em in the door, get 'em out…”. They’re not interested in research because there’s no certain return on investment, so they may eat the costs like overhead. With ACell, all those reasons I gave above for HT doctors not to experiment with new techniques go out the door, they’re not valid. ACell is already FDA approved. It costs little to “research” this stuff, but it would reap great dividends if the docs can convinve enough of the public that it, say, significantly enhanced HT results. It would be a marketing coup made in heaven – minimal research costs (because the subjects are generally PAYING patients who are just getting ACell added on as a bonus), but a windfall in public relations because it’s easy to generate a buzz of excitement about this stuff. That is all the MORE reason, then, why the testing has to be done under the strictest scientific conditions, accurately, and with control subjects (or scalp areas) not treated with ACell, for direct comparison. I am saying that because the possibility of hyping this thing even if it’s not really effective is so high, and so easy to do, that is PRECISELY why we need testing with the most painstaking standards to produce ACCURATE, REPRODUCIBLE results! As for autocloning, same thing. Although it looks promising and would be exciting, I’m not going into any HT doctor’s clinic for HT or autocloning, until they can prove conclusively that the plucked hairs cycle. When that is proven, I’ll be the first in the door. Other users here always complain that I just ‘promote’ Dr. Gho! Even if the economy is down right now, if some ht surgeon would make this auto cloning possible and working i can guarantee you that everyone wat to get it done. So i can say you are semi right, cause look at Armani he didnt change his absolut way over the top fees. I think this time its more a thing about HT docs really wanting to help people, because if you look at things in the past, it is now more difficult then ever to rip people off, because of the internet. The only thing concerning right now should be " Hair cycling. And i have to be honest, since some months now, i began to not care about my hair, cause in the next few years there will be solutions with more then satisfying results. So well iam not commenting in this forum that much lately because why should i argue with idiots anymore. And to make it clear what i mean, you guys should all be happy that hairsite provides this sub-forum as the first entry here. In one of the biggest german forums, hair research is treated like some snake oil. The admin even manages to ridicule the findings and results of Hitzig and Co.
All nes HM related toppics are always ridiculed in the german forum, and guess what the admin is on a paylist from some FUT-Clinics but he always claims otherwise. And the User Matigol is also a german sock puppet account who followed Iron_Man. By the way, your reasoning above contains the logical fallacy “post hoc, ergo propter hoc” – “after this, therefore because of this”. If the doctor sprinkles talcum or ACell or angel dust on your plucked hair and implants it and it grows, you ASSUME it’s because of the powder he sprinkled on the hair. But you don’t KNOW, because you haven’t compared it with a control where you saw the powder was NOT used. If you don’t know, but are willing to pay money to an HT doc just on that basis, good for you. But I want to see proof. » Other users here always complain that I just ‘promote’ Dr. Gho! LMAO, YOU CONVICTED YOURSELF IRON_JENKINS!!! A double account isn`t easy to handle!!! Next abusion waiting to happen, come on, get your ticket to hitzig. » » controlled experiment to see if the talcum powder was necessary or not. » ergo propter hoc” – “after this, therefore because of this”. » sprinkled on the hair. But you don’t KNOW . . .
You totally missed my point. Why do you think I said “I couldn’t care less”? Talcum powder or no talcum powder, what matters is I’d be getting new hair. That’s what I care about. Whether you get the hair without talcum powder, is mere scientific curiosity. And I don’t need to wait several more years for a series of clinical trials to see if hair regrows without the talcum powder. Ahab, I didn’t miss your point. I know you meant “I don’t care” rather than “I don’t know”. MY point is if you don’t care about something like this, you’re more likely to be snookered. Had. Bamboozled. Hoodwinked. Conned. Ripped off. Etc. Before I shelled out money for that sh*t, I would ask to see proof first. And I would want to know how it works. I understand, you don’t even care about “how”. Well you and me just differ there. For me, the “how” and “why” figure into the “if” – IF I am going to believe someone’s claim and spend money on it. I guess you’re more with Marlo Stanfield from The Wire, who, when telling a friend that Omar Little had been killed, said: “Don’t know the ‘who’, don’t even know if there was a ‘why’”. » » ergo propter hoc” – “after this, therefore because of this”. » » sprinkled on the hair. But you don’t KNOW . . .
» is mere scientific curiosity. » trials to see if hair regrows without the talcum powder. 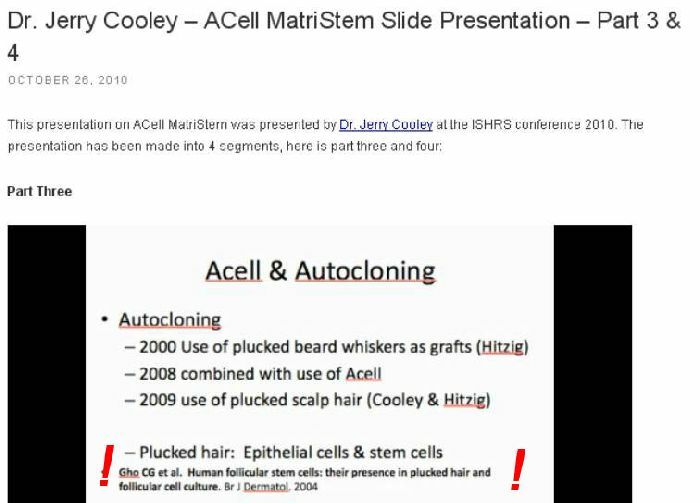 It would be reasonable to ASSUME that IF hair follicles can be regenerated when used in conjuction with Acell and this was not possible before the introduction of Acell…Acell is what made the difference…or am I incorrect and they were regenerating complete follicles (as in Cooley’s study) previously and I just missed it??? I agree Willy, but as much as I like, respect, and admire these doctors (I really do think Cooley and Hitzig are very smart guys, caring docs and way ahead of almost everyone else in their industry), I’m not just going to take their word for it (whether it’s the supposedly “much better” or “amazing” results in HT when ACell is used, or whether pre-treatment with ACell causes plucked hairs to become permanent, cycling hairs…) I want to see the cold, hard, EVIDENCE, and that means side-by-side tests with a control group not treated with ACell, or MUCH BETTER THAN THAT, side-by-side tests with and without ACell on the same patients’ scalps. As much as I like these two doctors and think their work is serious, ONLY positive results on tests performed as I described above will be enough to convince me to have this treatment (plucking/autocloning + ACell) done. There MUST be controlled testing or it doesn’t convince me of anything! » follicles (as in Cooley’s study) previously and I just missed it??? » Ahab, I didn’t miss your point. » I know you meant “I don’t care” rather than “I don’t know”. » likely to be snookered. Had. Bamboozled. Hoodwinked. Conned. Ripped off. » Before I shelled out money for that sh*t, I would ask to see proof first. » And I would want to know how it works. » going to believe someone’s claim and spend money on it. » don’t even know if there was a ‘why’”. » » » ergo propter hoc” – “after this, therefore because of this”. » » » sprinkled on the hair. But you don’t KNOW . . .
» » is mere scientific curiosity. » » trials to see if hair regrows without the talcum powder. I know all about the scientific method and controlled experiments that are reproduceable. But I also live in the real world. And I more than anyone here needs what Cooley and Hitzig say to be true. But I am too smart to rush out and have either of those two work on me yet. I am waiting to see this idea being taken up by other doctors to see if other doctors can duplicate the findings of Cooley and Hitzig, and for the technique to be further refined through the practice of it. If Cooley and Hitzig are blowing smoke, it will come out in time. These are practicing doctors, not lab researchers. If you want rigorous controlled experiments to be done before you have this done to you, you pay for it. Me, I’ll wait to see how this plays out in the real world. If Hitzig and Cooley have found a way to give as much hair to people as their findings so far suggest, you won’t need any rigorous controlled experiment to verify that. Because over the next few years, you’ll be seeing increasing numbers of bald people all over our neighborhoods and in our work places and entertainment stars, all growing significant hair on their heads. And the media will be all over this story by that time, too. Why are u even wasting your breath about something that won’t happen in the real world, or that won’t happen for a long, long time, if ever?